Drew Peterson Gets 38 Years; Shouts & Whines! (AP) – Drew Peterson—the swaggering former suburban Chicago police officer who gained notoriety after his much-younger fourth wife vanished in 2007—was sentenced to 38 years in prison today for murdering his third wife. The sentence came moments after Peterson shocked the courtroom as he proclaimed his innocence in the death of Kathleen Savio. "I did not kill Kathleen!" he shouted at the top of his lungs, emphasizing every word. Peterson seemed to look across the courtroom at Savio's family. Savio's sister Susan Doman shot back, "Yes, you did. You liar!" before the judge ordered sheriff's deputies to remove her from the courtroom. Illinois does not have the death penalty, and the 59-year-old Peterson had faced a maximum 60-year prison term. Jurors convicted Peterson in September in Savio's 2004 death. Peterson is also a suspect in the disappearance of Stacy Peterson—who was 23 years old when she vanished—but he hasn't been charged in her case. It was her disappearance that led authorities to take another look at Savio's death and eventually reclassify it from an accident to a homicide. 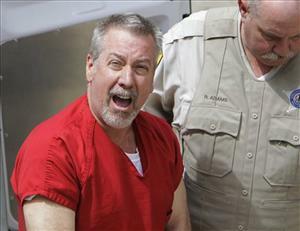 Re: Drew Peterson Gets 38 Years; Shouts & Whines! I wish they had cameras in the courtroom. Why do some high profile cases allow cameras and others do not? I wish I knew! I wonder the same thing myself. I believe it's up to the judge. I read the main reason being security and safety of those involved in the case. I suppose no one gave a crap about the security and safety of those involved in the OJ case. I think Casey Anthony was at the top of the most hated people in America also, but, hers was televised. Depends on the state and judge. Maybe Fed court was the reason for no cams? But I'd of gladly paid Pay-Per-View prices to see that fit he threw in court. He was so smart and cocky in the beginning; untouchable. Now all the brothas in his new home will take turns touching him He's fucked, literally! Maybe Fed court was the reason for no cams? But I'd of gladly paid Pay-Per-View prices to see that fit he threw in court. He was so smart and cocky in the beginning; untouchable. Now all the brothas in his knew home will take turns touching him He's fucked, literally! Ladies & gentlemen, beware of men named Peterson. This is the third one; Michael, Scott and Drew! I don't get their appeal! I really don't! Beady eyed loudmouths who thought they were smarter than everyone else, especially Drew! Smug as Hell was he! I know Michael was an older man and don't recall what he looked like to be honest, but, he pushed his wife down the steps and insisted she fell! Injuries didn't match the coroner's findings! I believe he was an author and the wife wanted a divorce, if memory serves. May Drew rot in Hell with Scott for what they did to their exes and Laci's unborn son!